Oscar week is in full swing in Los Angeles, and celebrities hit the red carpet for three big industry events on Tuesday, Februrary 22. In the early evening, stars like Pierce Brosnan, Jeremy Piven, and The Social Network‘s Armie Hammer headed to Eveleigh on Sunset for an event hosted by director Paul Haggis and Vanity Fair. Presented by Briani, the party celebrated Artists for Peace and Justice, an organization dedicated to providing relief to Haiti. Across town, Vanity Fair hosted another party honoring Wendy Stark Morrissey at the opening of Ray’s and Stark Bar at LACMA. Attendees included Suzanne Sommers, Brian Grazer, and Dianne Von Furstenburg. Some stars, like actress Joan Crawford and Mamie Gummer, party hopped between both events, and also made an appearance at Interview Magazine and Hugo Boss’ dinner honoring director David O. Russell‘s Oscar nomination for The Fighter. Other guests included Milla Jovovich, Gossip Girl’s Ed Westwick, and of course, Russell himself. Expect a clash of classics and… rump shaking in Sunday’s Oscar telecast. Anne Hathaway, joined by James Franco as very untraditional Oscars co-hosts, is working to quiet the doubts about her comedic chops and get viewers excited about a new generation of hosts. And if she can go from classic opera to hip hop like this on the real telecast, well, the Academy may have made a very inspired choice. The star, continuing her series of re-imagined film classics, quickly makes the switch from the iconic “Don’t Cry For Me Argentina” from Evita to Wreckx-N-Effect‘s “Rump Shaker” in this promo. It’s hard to tell whether she’s more dictator’s wife or hip hop impresario — why don’t you watch and decide? But remember: no cruel jokes. After all, Hathaway won’t be making them, either. Hear that, Ricky Gervais? 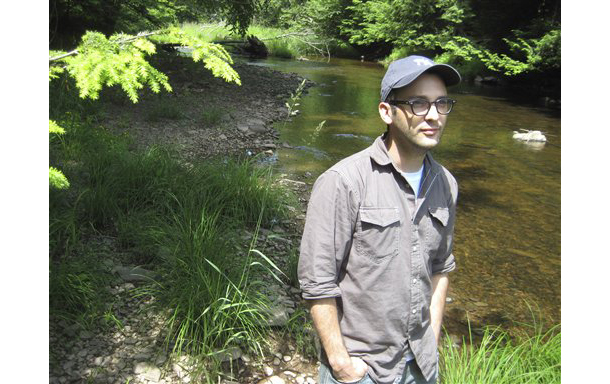 Josh Fox‘s home sits in the woods of Milanville, Pennsylvania, near the rushing waters of the Delaware River. In May 2008, a strange letter appeared in his mailbox. A natural gas company was offering him $100,000 if he granted them permission to drill on his property. Instead of signing, Fox decided to investigate. 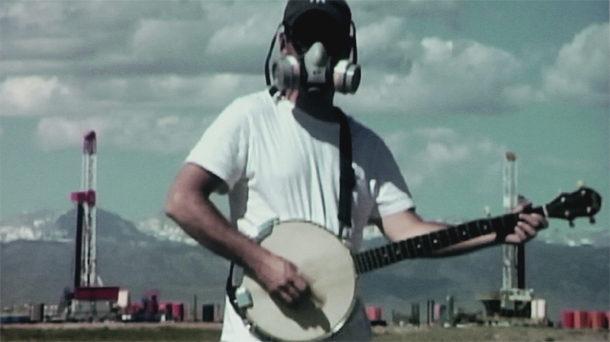 Armed with a video camera and a banjo, he set off on a journey up and down the Marcellus Shale, a massive reserve of natural gas that stretches 600 miles from Pennsylvania to Maryland, Virginia and into Tennessee. Known as the “Saudi Arabia of natural gas,” the shale contains billions of dollars in untapped fuel. Fox wanted to know: What happened to other families who agreed to drilling on their property? What he found was a heartbreaking collection of severely ill families whose aquifers had become so tainted by the gas, they could literally light their tap water on fire. 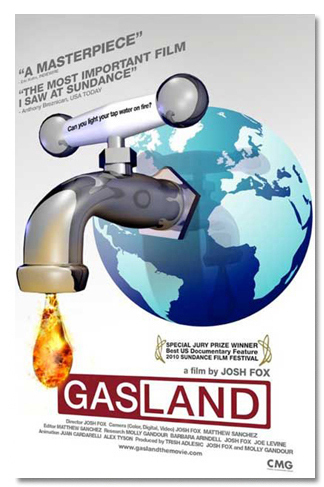 He edited his footage into a modest documentary, Gasland, which was soon embraced by outraged viewers across the country. It won the Special Jury Prize at the Sundance Film Festival, the Lennon-Ono Peace Prize, and now has been nominated for an Academy Award for Best Documentary. With the spotlight, Fox has been transformed from a mild-mannered art director at a Brooklyn theater company to a respected filmmaker to an outspoken activist on par with Erin Brockovich, a professional thorn in the side of the natural gas industry. A few weeks before his Oscar nod, Fox spoke with me about the unexpected acclaim and the oil lobby’s efforts to crush his documentary. Kors: The movie opens with you, in 2008, getting a letter from a natural gas company offering $100,000 to drill on your family’s land. 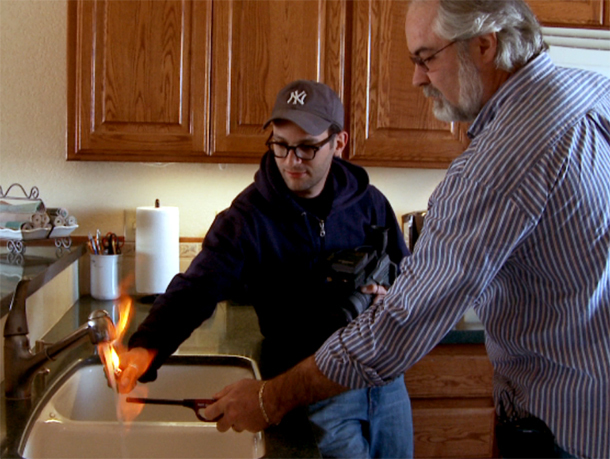 Was that really how your investigation started, or were you looking to make a documentary about natural gas? Fox: Oh, not at all. When I got that letter, I was working down in the city as an art director, doing shows with actors and dancers. I didn’t know anything about natural gas. I certainly didn’t intend to make a documentary about it… or spend years investigating it. Kors: Your film gets into the dirty details of this new drilling technique called hydraulic fracturing, or fracking, where they bore a long, narrow hole thousands of feet into the Earth, then blast into it with water, sand and chemicals, cracking the rock and freeing the natural gas. 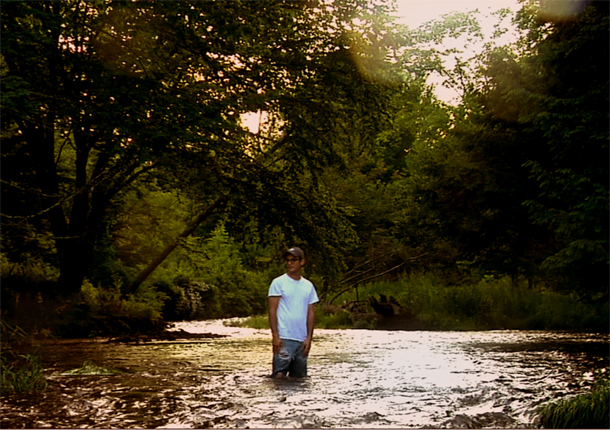 Every town you visit in the film, the fracking has begun, and the drinking water has already become poisoned. Now, the drilling companies are saying the chemicals they’re blasting into the Earth can’t possibly escape their pipes and, thus, can’t leach into the drinking water. So, how is the water getting contaminated? Fox: Nobody knows. There’s never been an investigation. But everywhere they use this fracking process, all these illnesses keep popping up: cancer, liver damage, birth defects. And yet every single investigation into fracking has been shut down. The [Environmental Protection Agency] wanted to investigate in 2004, but the Bush administration shut that down because it was obvious who was to blame… The EPA has just started an investigation into all this. It’s not adequately funded, but it is moving forward. Two years from now, when the study comes out, we’ll see what they have to say. Kors: I spoke with residents of Dimock, Pennsylvania, where the drilling has left a lot of people ill, and they told me Washington should suspend the drilling until they figure out how the chemicals are leaching into the drinking water. Fox: Makes sense to me. If they push forward with this drilling, and people keep getting sick, they’ll have to admit what this really is: a huge experiment on the American people. It’s completely irresponsible. Kors: The natural gas companies are saying there’s no proof that fracking is causing this wave of diseases. Fox: Well, of course you can’t prove something that’s never been investigated. (Fox laughs.) That “proof” claim has become the industry’s mantra: the link between the diseases that occur everywhere they drill and the fracking toxins isn’t proven. In any field, it’s very hard to establish a direct, causal link. Kors: That would take an extensive investigation. Fox: Absolutely. You have to watch their language too. When they say there’s no proof that “fracking” has caused harm, they’re talking specifically about the drilling and pushing of water into the ground. The reality, though, is that fracking is a much more complicated process than just drilling into the ground. It involves trucking in the toxic chemicals and trucking out the waste water: 1,200 trucks coming and going to maintain a fracking site. Forget the drilling: the possibility for an accident and massive contamination right there, with those trucks, is very high. Kors: One theory is that the tubes the companies are using to pipe chemicals into the ground are failing. Fox: That’s right. That’s the main theory: that the tube casings are failing. And when I learned about the way the casings are tested — the lack of regulations on them — it’s amazing. The companies test the strength of their tubes by applying 7,000 pounds of pressure per square inch. But when they’re inserted into the ground and used for fracking, the casings have to withstand up to 20,000 pounds per square inch. So, is it any wonder that they’re failing? How could the companies possibly reassure us that their tubes are safe if they’re not even testing them at full capacity? It’s ridiculous and really dangerous. Fox: That’s right. We’re for renewable energy: wind, solar, geothermal, biofuels. Right now the natural gas industry is in competition with renewable energy. Middle school kids should be looking forward to a cleaner planet, and it’s natural gas that stands between them and that future. You know, I was just in Iceland, and there, it’s almost all geothermal and hydroelectric power. Kors: Yeah, but Iceland is much smaller. It’s less than half a million people. And Riha was very clear. She said renewable energy simply isn’t ready. Fox: That’s ridiculous. I mean, natural gas is not ready either. We’re laying down billions of dollars worth of pipelines to run this country on natural gas, and it’s going to take decades to set that up. Of course, in their commercials, the industry is trying to sell natural gas as not just ready but as a clean alternative. Kors: Right. “Clean, abundant natural gas.” The fuel of the future. Fox: But the way the refining process vents off raw methane, natural gas is on polluting par with coal… We’re in a race right now to stop climate change. And we are running out of time. It’s attitudes like Riha’s that keep pushing us in the wrong direction. We have enough wind to potentially power a large portion of this country. And it’s utterly specious to say that with a solid investment, renewable sources couldn’t become our main source of energy. Look at the incredible solar fields in Germany. That’s the direction we should be moving in. Kors: You feel passionately about this. Fox: (Fox laughs.) Yeah, I do. I’d say, even if we had rolling blackouts — if the electric company had to turn the lights off six hours a day — that would be better than poisoning our water with drilling. The message needs to get out there: Once you contaminate an aquifer, you can’t go back. There are projections that within 10 years, our solar and wind farms could be up and running in a serious way. What’s stopping us, I think, is not technological obstacles or logistical problems, it’s the power of the gas industry’s lobby. Kors: The gas industry is not that happy with you. Fox: (Fox laughs.) No, they’re not. Kors: They put out this bizarre video of a beautiful woman speaking passionate, breathy words about how majestic our country is and how many factual errors there are in your documentary. Fox: Yeah. On their website too they put up an essay detailing the “errors” in the film. Everything they said was 100 percent false. It was a smear campaign. If anybody wants to read it, we put a point-by-point rebuttal to their rebuttal on our website. Kors: This movie, I imagine, must feel like a long, strange trip. What’s been the most surprising turn of events? Fox: Actually, it was that: the industry’s reaction, that they attacked us so head-on. I knew the movie was going to turn a lot of heads. But by attacking it, they drew so much more attention to the film than I ever could have. And all that scrutiny just shined a brighter light on how false all of their claims were. But… I guess that’s what they thought they had to do. Kors: One of the reasons the film is so powerful is that you really get to see what life is like inside these families ruined by poisoned water. They let you into their homes. They show you how their water is so tainted it can be lit on fire. The mothers talk about how they’ve fallen ill and have kids to take care of. Kors: The part of the movie that really angered me focused on the so-called “Halliburton loophole,” which was inserted into the 2005 energy bill at the urging of Vice President Cheney, the former CEO of Halliburton. That provision strips the EPA of its authority to regulate fracking. Fox: That’s right. If it weren’t for the Halliburton loophole, the oil companies wouldn’t be able to do what they’re doing. Now, thanks to the loophole, they’re allowed to blast toxins into the ground without reporting it or even telling us what chemicals they’re using. 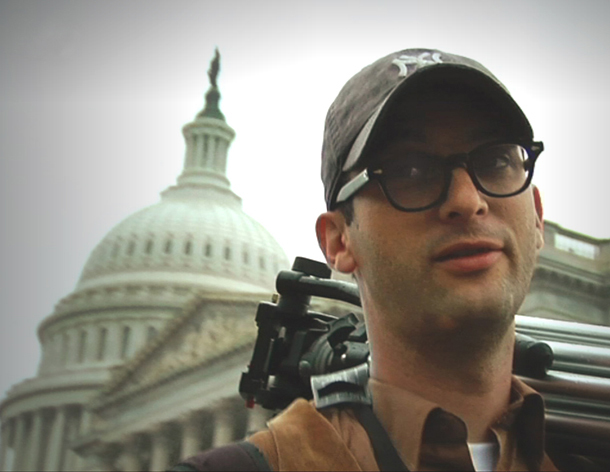 If we don’t know exactly what’s being injected into our land, how can we know whether it’s safe or not?… When I started making the film, most congressmen weren’t even aware of that loophole. Hopeful now more of them will get involved in this fight. Kors: You’ve gone from doing Brooklyn theater to winning at Sundance, accepting the Lennon-Ono Peace Prize in Reykjavik, and now the Oscars coming up. Fox: The whole thing is dizzying. 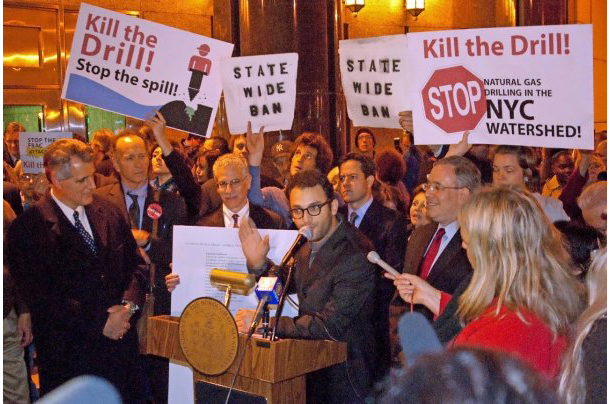 With each film festival and award ceremony, the movie’s gotten more attention, and so has the larger issue of drilling and water contamination. I hope that continues, that more people learn about the movie, embrace its message and become a part of the movement. The British monarchy saga “The King’s Speech” leads the Academy Awards with 12 nominations, including best picture and acting honors for Colin Firth, Helena Bonham Carter and Geoffrey Rush. “This story has struck such a rich resonant chord with audiences of all ages, which is very exciting – to have your work honored by your industry peers is even better,” Rush said in a statement. “True Grit” ran second with 10 nominations, including acting honors for Jeff Bridges and Hailee Steinfeld. The Feb. 27 Oscars set up a best-picture showdown between two favorites, “The King’s Speech” and “The Social Network.” “The Social Network” won best drama at the Golden Globes and was picked as the year’s best by key critics groups, while “The King’s Speech” pulled an upset last weekend by winning the Producers Guild of America Awards top prize, whose recipient often goes to claim best picture at the Oscars. The best-actress field shapes up as a two-woman race between Annette Bening for “The Kids Are All Right,” who won the Globe for actress in a musical or comedy, and Natalie Portman for “Black Swan,” who received the Globe for dramatic actress. “The Social Network” casts Jesse Eisenberg as Facebook founder Mark Zuckerberg, who’s depicted as an interpersonal lout in one-on-one relations but a genius for the masses, creating an online hangout where half a billion people now keep connected with friends. “The King’s Speech” stars Firth as Queen Elizabeth II’s father, the stammering George VI, who reluctantly came to the throne after his brother abdicated in 1936, a terrible time for a stuttering monarch as British subjects looked to their ruler for inspiration via radio as World War II approached. 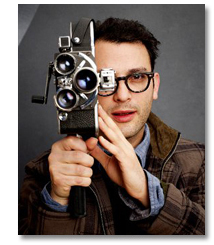 The two films represent a showdown between classy, traditional Oscar bait and edgy, youthful, up-to-the-minute drama. With its aristocrats, statesmen and perilous times, “The King’s Speech” is a throwback to the majestic, eye-filling costume pageants that dominated film awards in Hollywood’s earlier decades. Its nominations also include best director for Tom Hooper and supporting-acting slots for Bonham Carter as the king’s devoted wife and Rush as his wily speech therapist. “The Social Network” is an immediate story, set not in palaces but college dorm rooms, cluttered start-up space and anonymous legal offices where Zuckerberg battles former associates over the proceeds of his invention. David Fincher is the best-directing favorite for “The Social Network” after winning that prize at the Globes. The directing category is back to an all-male lineup after Kathryn Bigelow became the first woman to win that prize last year for “The Hurt Locker,” which also claimed best picture. The Oscar ceremony will be televised live on ABC from Hollywood’s Kodak Theatre.